Search for all "Osteoprotegerin / TNFRSF11B"
Tnfrsf11b, also known as tumor necrosis factor receptor superfamily member 11B, is a member of the tumor necrosis factor receptor TNFR superfamily. It inhibits the activation of osteoclasts and promotes osteoclast apoptosis in vitro. Also It plays a role in preventing arterial calcification. 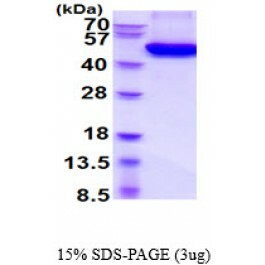 Recombint mouse Tnfrsf11B, fused to His-tag at C-terminus, was expressed in insect cell and purified by using conventiol chromatography techniques. Min H., et al. (2000) J Exp Med. 192:463-474.Simonet WS., et al. (1997) Cell. 89:309-319. Phosphate Buffered Saline (pH 7.4) containing 10% glycerol.